This very tough plant is commonly used in mixed containers, hanging baskets, and window boxes. 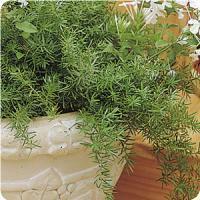 Its green, needle-like foliage adds texture and interest to the containers, when combined with other plants or used alone. It can also be grown indoors as a houseplant. Heat and drought tolerant.